The aorta is the major artery that carries blood away fro the heart and to the whole body. The artery starts from the left sided pumping chamber (left ventricle) and runs initially in the anterior part of the chest. Subsequently, it turns backwards before bending again in a downward direction, running down the whole length of the chest and the abdomen very close to the spine. Coarctation is a word that means narrow. Thus, aortic coarctation is a congenital heart defect where the aorta is narrowed at a specific point. This video shows very clearly how the blood flows in a normal heart and you might find it helpful to understand how an aortic coarctation can affect your child. The consequences of an aortic coarctation is that the left ventricle is put under increased strain as it has to work harder to pump blood downstream the coarctation. 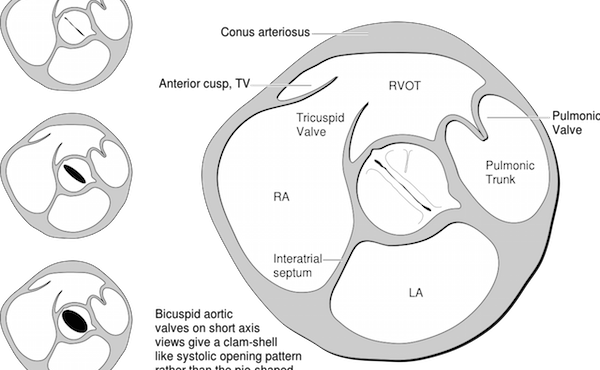 As a result the left ventricle becomes thicker (or hypertrophic). Arterial blood pressure can also be increased in aortic coarctation as the blood cannot escape the upper part of the body. Conversely, the lower part of the body is receiving blood at a low pressure and this can cause problems with the kidney function but also with the leg muscles.A coarctation can occur anywhere in the aorta but the area just after the origin of the left subclavian (the artery that feeds the left arm) is the area most commonly affected. 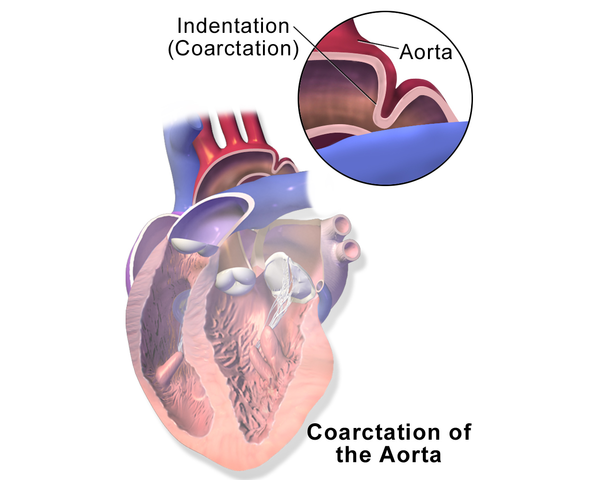 In some children the area where the aorta bends in the chest (the aortic arch) can be the area of coarctation, whereas in some other children the aorta in the abdomen is affected. In some rare cases the aorta itself can be completely blocked as if a part of it had not completely and fully developed (interrupted aorta). Aortic coarctation is a congenital defect of the heart in the sense that generally children are born with it, even though very mild forms can go undetected for months or years until the condition has progressed or symptoms appear. About 8 in 1000 children are born with a congenital heart problem, and coarctation represents about 8% of those cases. Coarctation occurs more commonly in boys, even though it is often seen in girls with Turner syndrome (a genetic condition where one of the 2 X chromosomes is either incomplete or missing). In some children, aortic coarctation can be associated with other heart defects, such a VSD or an aortic valve problem (such as a bicuspid aortic valve, which is a condition where the outflow valve from the left ventricle has only two leaflets instead of the normal three). There are instances of families with multiple children affected by aortic coarctation, usually of different degrees and severity. What are the symptoms of aortic coarctation? In some children, the narrowing is minor and might not even cause symptoms. In other cases, the aorta is more constricted, placing a strain on the left ventricle.The typical presentation of coarctation is in the first few days or weeks after birth when children become unwell and develop symptoms as the arterial duct spontaneously and normally closes after birth. Typically, children present with lethargy, poor feeding, pale or mottled skin colour and breathlessness. In some children the diagnosis can be suspected before birth by foetal echo but this is unusual as some of the changes that occur after birth are related to the development of coarctation. Some children are born with very mild degrees of coarctation and it can take weeks, months or sometimes even years for the full coarctation to develop. In the meantime, the problem can easily go unnoticed. In these children and adolescents the finding of a heart murmur or high blood pressure on the upper limbs can be the first sign of aortic coarctation. Chest pain and reduced tolerance to exercise are also reported complaints. Achy legs are sometimes reported, especially in relation with exercise. Some people with aortic coarctation are not diagnosed until they are adults but this is now quite unusual. Children with signs or symptoms suggestive of aortic coarctation should be referred to a paediatric cardiologist for investigation. 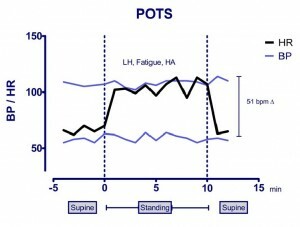 One of the main findings on examination is a reduced pulsation in the groin/leg arteries due to the fact that blood pressure is dampened and lower beyond the coarctation. A higher blood pressure in the upper limbs is also indicative of an aortic coarctation. A heart murmur can also often be heard. 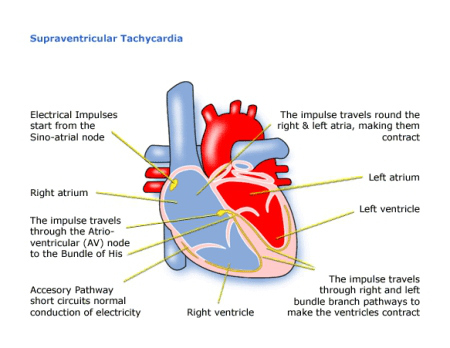 The paediatric cardiologist will also perform an ECG (a recording of the electrical activity of your child’s heart) and an echocardiogram (a detailed ultrasound examination of he heart) to confirm the presence, location and degree of the narrowing and the consequence on the left ventricle. In small children these investigations are generally sufficient to have a complete picture and to make a recommendation for treatment. In older children or adolescents or in children where the anatomy of the aortic arch is unusual, a chest CT or MRI is suggested in order to understand the need for treatment and the best management plan. A severe coarctation is usually diagnosed in the first few days after birth and generally requires urgent surgical treatment. The chest incision will be from the left side of the chest. The most common technique consists of removing the narrow part of aorta and reconnecting the 2 ends back together. 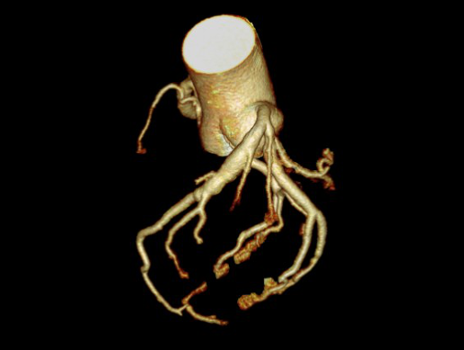 Even though this technique is very effective, there is a small chance that the aorta surrounding the reconnected aorta might not grow appropriately over time, causing a progressive recurrent narrowing (called by doctors re-coarctation). In older children or in children who have developed re-coarctation, another technique to relieve the narrowing is by using a balloon to dilate the narrow part (the procedure is called angioplasty). The empty balloon is passed across the narrow area and, after careful monitoring, it is inflated with liquid in the exact area of narrowed aorta, thus stretching the narrow part of the aorta. In some older children the paediatric cardiologist might also apply a small metal device (called stent) to the same area using the same technique. The purpose of the stent is to help in keeping the narrow part of aorta well open. The recovery after both surgical and balloon treatment of aortic coarctation is generally complete and very quick. Many of the symptoms will disappear or significantly improve soon after the coarctation has been successfully treated. Children with successfully treated aortic coarctation can expect to lead a normal life. However, they need to be under regular, life long follow up with a paediatric cardiologist to monitor for high blood pressure and occurrence of re-coarctation.